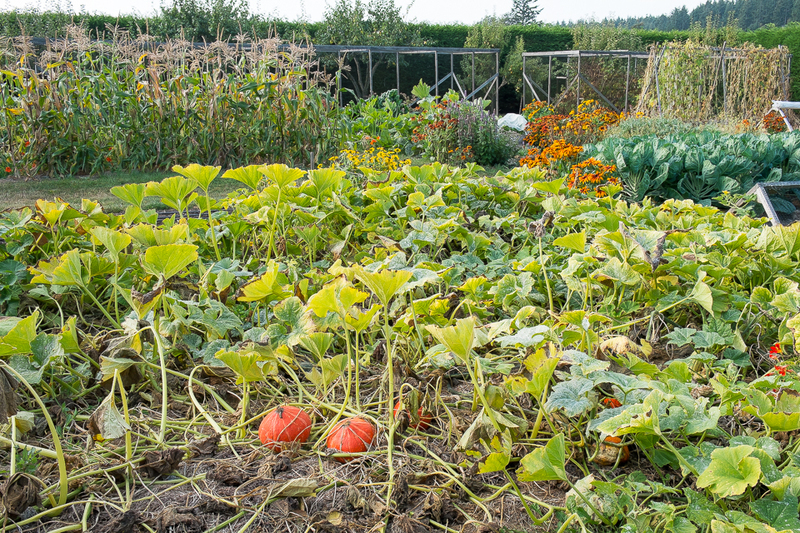 While we have the pleasure of harvesting fresh vegetables year round from our four-season kitchen garden, there is also the pleasure of an extra big harvest of storage vegetables in the weeks leading up to the fall equinox. Toward the end of August, I pulled large globes of Copra and Redwing onions and smaller bulbs of Ambition shallots and dug hills of potatoes, round Yellow Finns, oblong Carolas, slender Banana and Rose Finn Apple fingerlings. All are stored away now in cool, dark places, potatoes in the garden shed closet and onions in the shop. I’ve blanched and frozen many pints of shell beans and corn, roasted, peeled and frozen pounds of peppers and filled jars with dried tomatoes. And in the days around the equinox I packed brown paper bags with dry bean pods to shell later and piled a wheelbarrow high with winter squash. Our exceptionally warm and long growing season this summer made all of this storage harvest especially gratifying. As my bean-growing friend Carol said, “It was the perfect summer for letting all the dry beans dry in their pods on the vine.” I thought back on our lovely summer as I harvested dry pods of bush beans Cranberry, Drabo, and Midnight Black Turtle and pole beans Aunt Jean, White Runner, Pole Cannelini, Soissons Verte and Good Mother Stallard. The day was perfect, sunny and mild, and the steady work of pulling pods from stems and clearing dry leaves and empty plants from the rows left plenty of time to contemplate the differences between planting and harvesting. 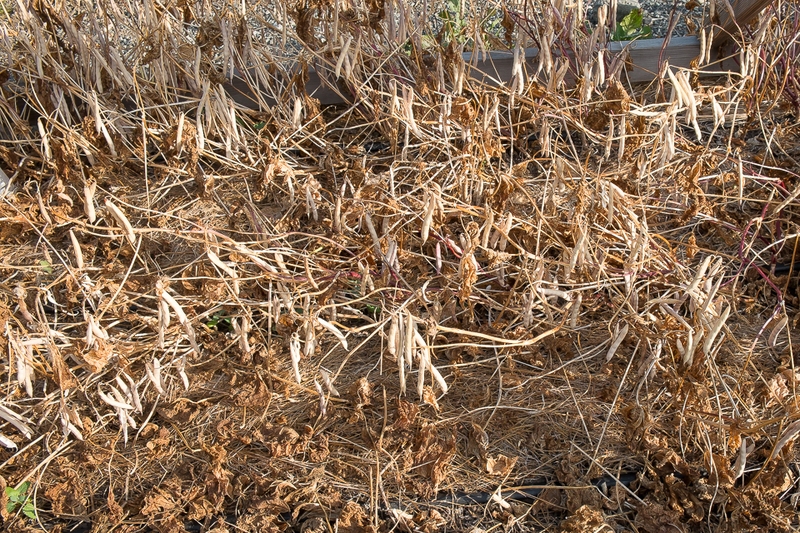 While spring planting brings release from winter and the promises of longer days and warmer temperatures, late summer harvest signals a restful slowing down as the days shorten and cool. I love the promise of spring but I love the fruition and completion of fall even more. The seeds I planted in the green of spring have germinated, grown and matured into plants whose foliage has changed from supple, early green to brittle brown and rust, yellow and gold. And here at the end of summer, the hope and anticipation in those small seeds of spring are more than matched by the great satisfaction of seeing bean pods hanging from stalks and great round squashes rising above their vines. The final satisfaction of the end-of-summer harvest happens as I pull the spent foliage from the beds, wheel it to the compost bins and then rake away the remaining layer of mulch to reveal the soil I last saw in spring. This year the sunny harvest days were followed by the first days of fall rain so the soil was already taking on the friable richness I associate with spring. In the next few days, I’ll add a thin layer of compost, a sprinkling of complete organic fertilizer and a cover crop, organic rye this year, to protect and nourish the soil through the winter. 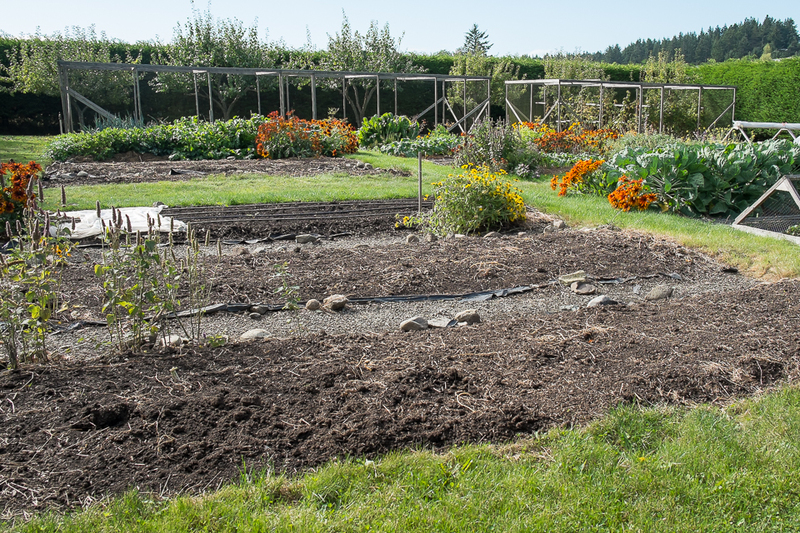 Scattering the seeds and raking them are the last big kitchen garden tasks for these beds this year. 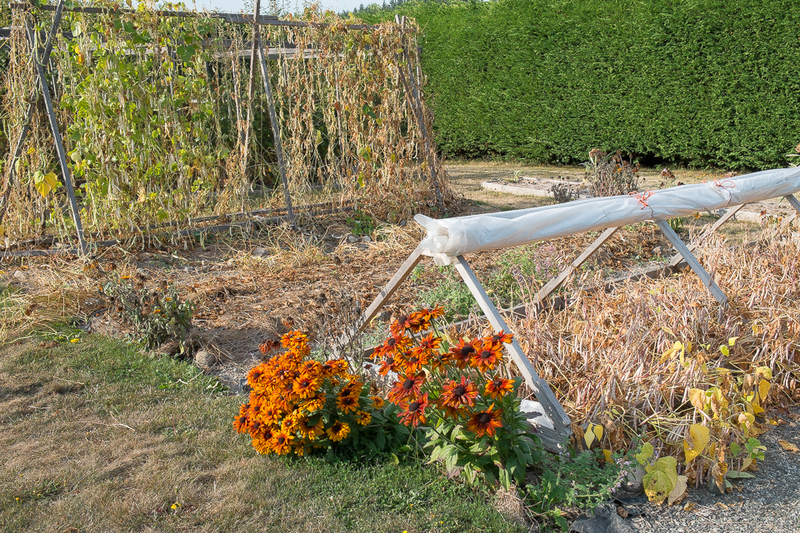 I’ll return to the beds next spring, work in the cover crops and begin planting for the year ahead. But between now and then I look forward to winter and the slow, quiet harvest of winter roots and greens that along with the just harvested storage crops will nourish us through the next season’s meals.